Polyester, rayon and spandex are all types of synthetic materials. Many items of clothing made from synthetics are made of blends of these three materials. Because the best way to clean synthetic materials is determined largely by the treatment the materials receive in production, it is important to read the care instruction label on the clothing. Care instruction labels will tell you whether the garment requires hand washing or dry cleaning. If the care label on your clothing allows for hand washing, rinse the tub or sink where you'll be cleaning your garments to guarantee its cleanliness. Add warm water to the tub or sink until it is about half full. Add a gentle detergent, such as Ivory or Lux, to the water and mix until it dissolves. Add cold water to the sink or tub until it is about three-quarters full. Gently submerge your garment in the water, making sure all the material is dampened. Using your fingers, lightly scrub stained areas until they are lifted away. It may take several minutes of scrubbing to remove tougher stains. Once the item is clean, remove it from the tub and gently squeeze excess water into the tub. 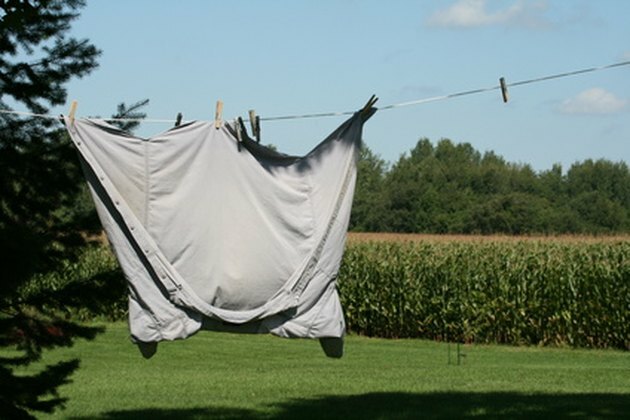 Hang the garment to drip dry on a clothesline. Pre-treat any stains on your garment by using a stain-removing pen produced by home dry-cleaning kits by rubbing it on the stain until it is removed. Then, using a cloth, remove the excess stain remover from the material. Put the garment inside one of the home dry-cleaning kit bags. You may clean multiple garments at once, as long as the bag is no more than three-quarters full. Add a cleaning pad to the dry cleaning bag. Use more than one pad for larger loads or tougher stains. Seal the home dry cleaning bag. Put dry cleaning bag into your dryer for about 30 minutes. While inside the dryer, the pad will heat up and steam your clothing clean. Remove your garment from the bag and dryer. The garment will be ready to wear immediately. Always follow the care instructions listed on your garment. If your garment does not have any care instructions, the safest cleaning option is dry cleaning. Submerging certain treated rayon blends in water will cause the fabric to shrink and become misshapen, so if you don't have care instructions, and your garment contains rayon, dry clean it rather than handwashing.